What happens when we run out of wine? 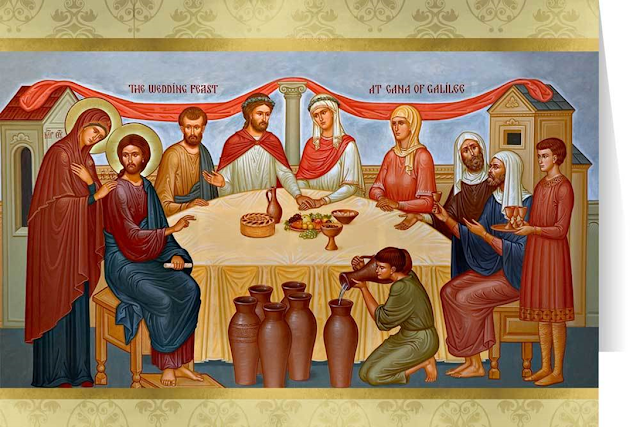 Later in the service, at the prayer before we distribute the bread and wine, we will hear the words, ‘In the water made wine the new creation was revealed at the wedding feast. Poverty was turned to riches, sorrow into joy’. That is what Jesus is doing when he turns water into wine. He takes one of the key elements of life – the ancients had four key elements: earth, water, air, fire (I’d have done a lot better in chemistry if we had kept to those four and not found 118 different elements – the periodic table killed me). But he takes water and he turns it into wine. Not just any old wine – but the best. And not just a little: he produces about 1100 bottles of wine. It is a very human story. 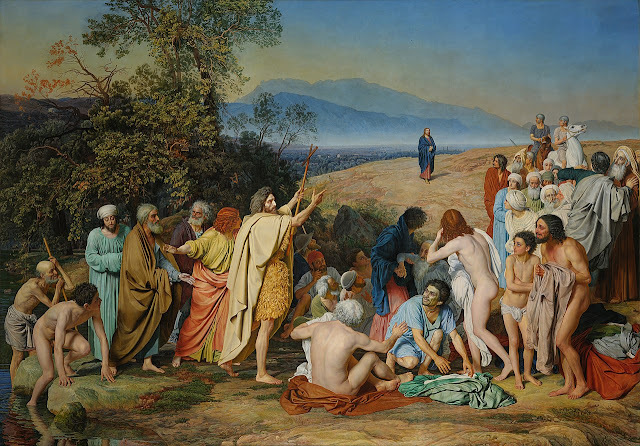 This time, last year when we looked at this passage, we were celebrating the wedding of Olga Fabrikantova and Simon Burke - and this story is about a wedding, a village wedding. There is John. He is the preacher. He baptises with water. He offers us ‘good intention Christianity’. And there is Jesus. Jesus is, as we heard in our reading, the beloved Son of God. He baptises with fire. And Jesus offers us ‘Holy Spirit Christianity’. So let’s look at John: the preacher He gives the people hope and he inspires them to make a new start in life. He gives people hope. Do you notice how it says here that the people are filled with expectation? And in the picture we see the old man trying to get up, and the look of delight on the slave’s face as John points them to Jesus.